Tom yum is a name for two similar soups originating from Laos and Thailand, respectively. The Royal Lao version includes a pinch of rice in the soup, whereas typical Lao and Thai versions do not include rice as an ingredient. Lao tom yum is relatively unknown outside of Laos, whereas Thai tom yum is perhaps one of the most famous dishes in Thai cuisine. It is widely served in neighboring countries such as Malaysia, Singapore, and Indonesia, and has been popularized around the world. Tom yum is characterized by its distinct hot and sour flavors, with fragrant herbs generously used. The basic broth is made of stock and fresh ingredients such as lemon grass, kaffir lime leaves, galangal, lime juice, fish sauce and crushed chili peppers. In Thailand, tom yum is usually made with prawns (tom yum goong), chicken (tom yum gai), fish (tom yum pla), or mixed seafood (tom yum talay or tom yum po taek) and mushrooms - usually straw or oyster mushrooms. The soup is often topped with generous sprinkling of fresh chopped coriander (cilantro) leaves. 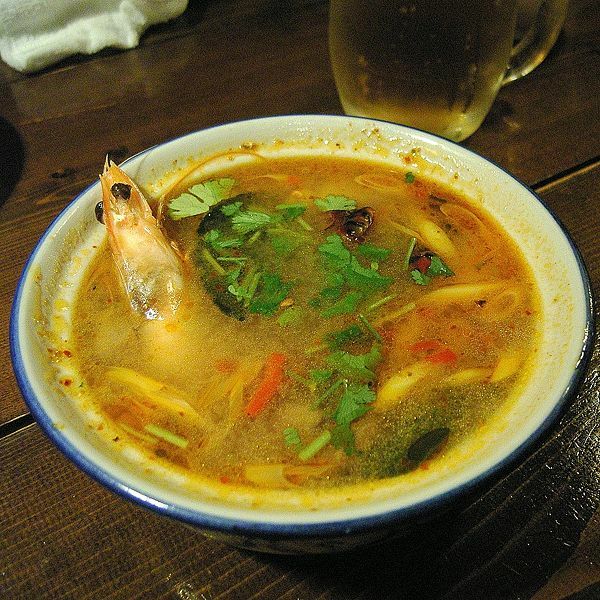 In Laos, tom yum is typically made with fish or chicken, but freshwater prawns are also available. Commercial tom yum paste is made by crushing all the herb ingredients and stir-frying in oil. Seasoning and other preservative ingredients are then added. The paste is bottled or packaged, and sold around the world. Tom yum flavored with the paste may have different characteristics to that made with fresh herb ingredients.